Few months back I had bookmarked a peanut butter cutout cookie recipe with heart shaped cookies and I wanted to try it for this year’s Valentine’s Day. I had almond butter at home and wanted to try the same recipe and make almond butter cookies instead. 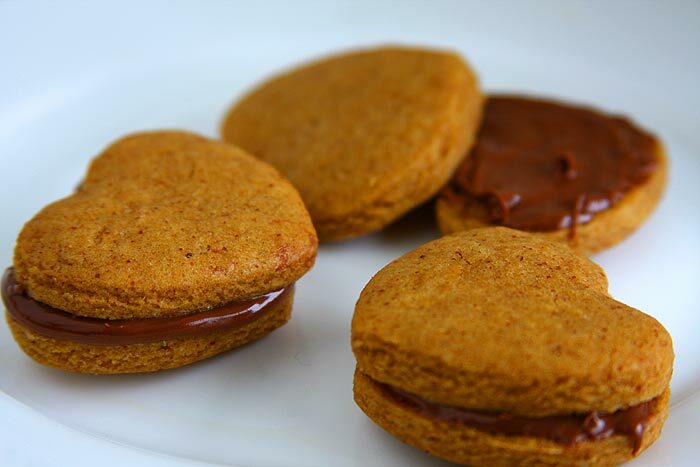 This almond butter cookie recipe is pretty straightforward like any other cookie recipe. Starts with creaming of almond butter and sugars. 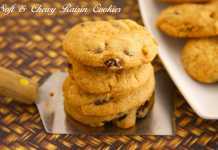 The original recipe had used brown sugar which I always replace with coconut palm sugar because of which the cookies tend to be darker in color than the usual cookies. Other than that you don’t feel any difference in the taste of the cookies. 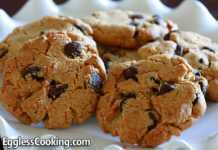 Also instead of the 2 eggs used in the recipe I have substituted it with Ener-G egg replacer because that’s the egg substitute which works best in almost any type of cookie recipe. 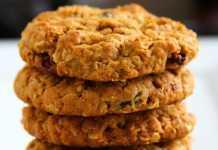 Flax egg is also another suitable egg substitute option for cookies but you won’t be able to get crispy cookies if that’s used, which is why I mostly prefer Ener-G for cookie recipes. Not surprisingly these almond butter cookies without eggs also turned out very crispy especially for the batch of cookies for which I had rolled the dough pretty thin. The original peanut butter cookies were decorated with frosting and sprinkles which I already did with the gluten-free cutout sugar cookies just few days back and didn’t want to do the same thing again. 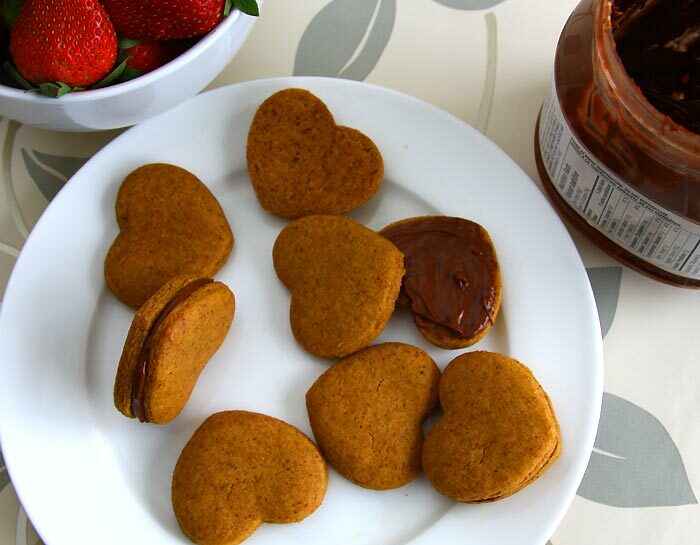 I remembered seeing another recipe in which cookie hearts were dipped in melted chocolate and I wanted to do the same for these no egg almond butter cookies. 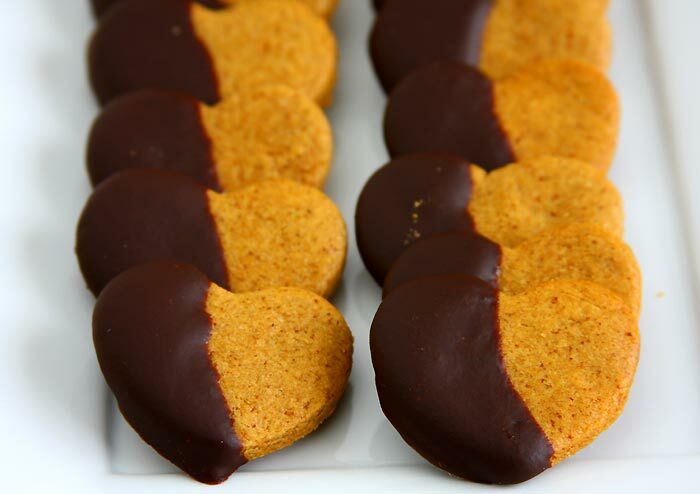 The chocolate dipped almond butter cookie hearts tasted very good like the novelty cookies you get in fancy tins. The only downside is that the chocolate starts to melt if the cookies are kept at room temperature for even few minutes. It has to be served directly from the refrigerator. Looking for more recipes using almond butter? 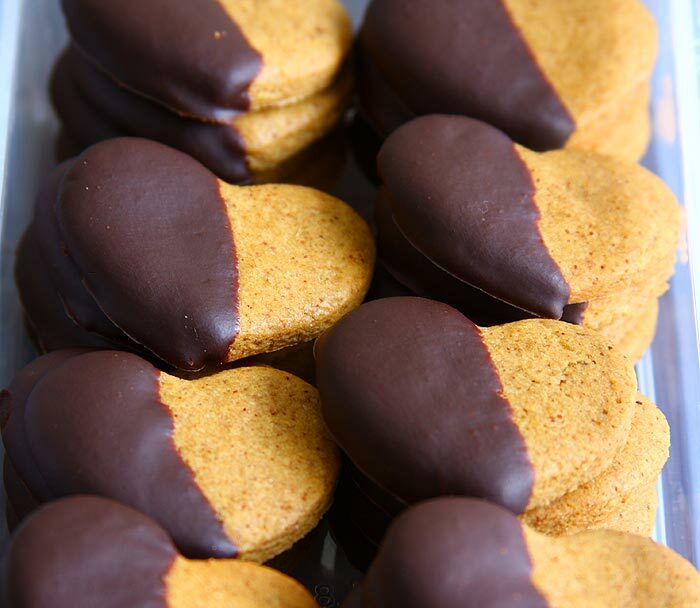 Crispy, chocolaty almond cookie hearts to brighten up any occasion. This almond butter cookie recipe is versatile because you can use this as a base recipe to make different themed cutouts for any holiday like Halloween, Christmas, Easter, etc. In a small bowl whisk together the Ener-G egg replacer and water; set aside. Sift the flour, baking powder and baking soda in a large bowl and keep it aside. In another large bowl, cream together the almond butter and sugars until light and fluffy, about 4-5 minutes. Beat in the egg replacer mix, milk and vanilla. Add to the sifted flour mix to the creamed mixture and mix well. Divide the cookie dough into two halves and place one half in between two parchment papers and flatten it using a rolling pin or press it evenly with a flat bottomed vessel spreading it into a large circle which is about 1/2 inch thickness. Cut into desired shapes with 2-in. to 4-in. cookie cutters. Place an inch apart on a baking sheet lined with parchment paper. Bake at 375Â° for 7-9 minutes or until edges are browned. Cool for 1 minute before removing from pans to wire racks to cool completely. Decorate the cookies as you desire. You can either frost it with ready-made icing and sprinkled colored sugar on it or pipe it with cool designs or dunk it in melted chocolate or spread Nutella on the bottom of a cookie and top it with another cookie to make chocolate cookie sandwiches like I have done. In a medium size bowl add the chocolate chips, butter and few drops of milk and melt it in a microwave oven until smooth. Add more milk if needed. Use a fork to break the chocolate chips. Let the melted chocolate cool a bit and then dip the cookies in it and place it on a cookie sheet lined with parchment paper. Once all the cookies are done leave the cookie sheet in the refrigerator for the chocolate to harden up. You will have to store the cookies in the fridge otherwise the chocolate will begin to melt. I have used Ener-G egg replacer for 2 eggs in the recipe. The baking time depends on the thickness of the cookies. For my first batch, I spread the dough pretty thin and got very thin and crispy cookies. 8 minutes was perfect for it. The second batch I rolled the dough a bit thicker than the first batch and had to bake the cookies for 10-11 minutes. 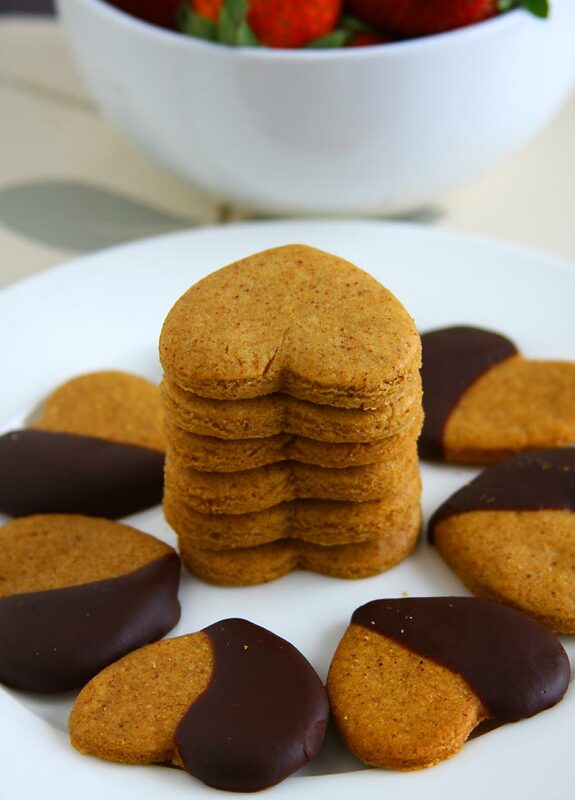 The number of cookies you will get also depends on the thickness of the cookies. The topping recipe is not for the entire batch of cookies. I just wanted to try a little and keep the remaining cookies plain. The given measurement was enough to coat 42 cookies. You will have to add milk in small increments to get the right consistency for dipping. Finally found something useful. I am allergic to eggs and this website made my life. I love your recipes and website. Can you please also share eggless gulab jamun recipe ? Greate Recipe I love Your website and cooking way..